Sunday morning, another sunny day in Accra and three power cuts so far this morning. Thank goodness we have a generator! No, it’s OK, we made oatmeal and sat on the balcony enjoying the breeze, looking at the city. My lovely husband has finally gotten us a 500 Gb/month Vodaphone connection, after much patience and waiting, which means we can actually listen to BBC radio! And use Internet without less worried counting of data use, which is great. It’s still slow and flaky, but a vast improvement, at 400 cedi a month, about 100 USD. To celebrate, and because the oven would be on (electricity is expensive here!) to make pizza, I made a quick apple cake as well. 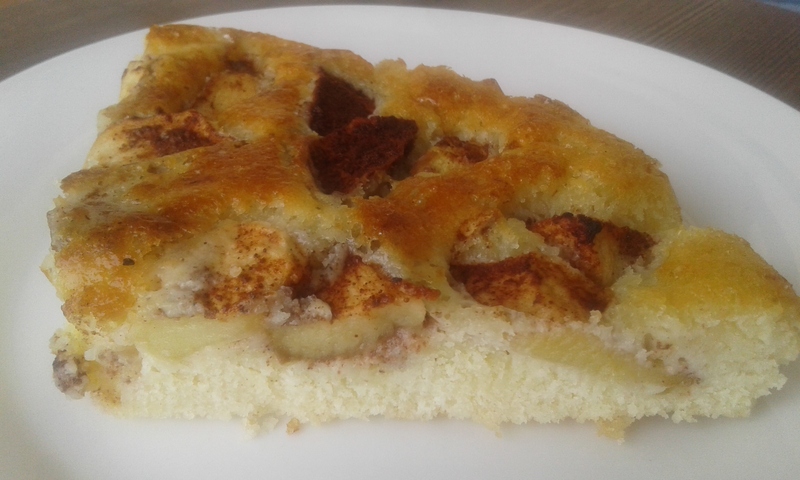 This is “Mors eplekake”, Mother’s Apple Cake from “Mat for all”, Food for Everyone. It was my first cookbook when I left home at 19 to go to university, and was a present from my youngest brother, who was 11 at the time. It’s a great basic cookbook: porridge, soups, bread, lutefisk, meatballs, and yes – cakes. When I was choosing which books to bring in our initial shipment to Accra, where every kilo counted, I packed two cookbooks: “Mat for alle” (for practical cooking) and Rachel Roddy‘s “Five Quarters: Recipes and Notes from a Kitchen in Rome”, for Roman inspiration and to both inspire and address twinges of homesickness for Rome. Much like the smell of an apple cake baking will do, though Accra is slowly becoming more home. Whisk eggs and sugar until light and fluffy. Add flour, baking powder, milk, and softened butter. (In Accra, butter will currently soften after about one minute out of the fridge. Five minutes, it has melted….) Heat the oven to 190C. Line the base of a round 25 cm baking tin with baking parchment, and pour batter in. Toss apple slices with a little cinnamon and sugar, and stick in then into the cake batter (pushed down a little,m the cake will rise. Fancy apple pattern optional.) Bake at 190C for 30 minutes or so, until done when tested with a cake wooden skewer and nicely golden on top. Very nice! Notes: The cake was a little low, probably because the eggs were quite small, but very buttery and delicious. I might use four small eggs next time. Eggs are randomly odd here, even supermarket ones, so I crack each individually before adding them to batter as some are weirdly opaque and strange in texture. I would have added ginger, if I’d had some. This was made with strong white bread flour, not cake flour. Great for bread baking, I am so pleased to have access to good flour here. It would have been good with vanilla ice-cream, which is quite nice here (and not imported! Fan Ice!) though getting ice-cream home before it melts is an ongoing challenge. Why call this apple cake via South Africa? Well, I was assembling this and looking at the ingredients: despite good intentions, there is a lot of imported food in our kitchen. Here, eggs from Ghana, yes, but apples, butter and flour from South Africa, bought here (Shoprite is a South Africa store). Semi-skimmed UHT milk from France (preferred for coffee, though I am learning to use the powdered milk from Ghana, which is fine but full-fat) . 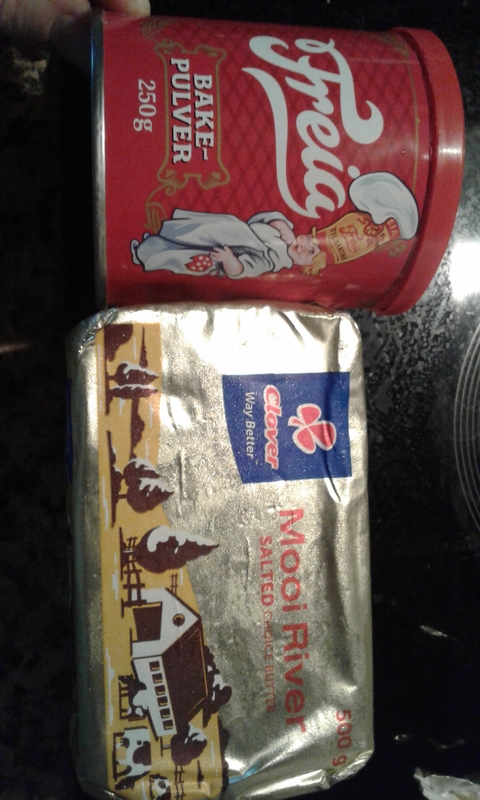 Ground cinnamon and baking powder from Norway. You can get baking powder here, but I know how this one behaves so I brought some the last time I went back, along with ground cinnamon, which I have still not found here, only cinnamon sticks. I have heard that there is a spice section in the market of Nima, a nearby neighbourhood here in Accra, so that is on my list to explore. A bit less daunting than the large central Makola Market. The quest for ground cinnamon continues! I might also find some local peppers, this article “Neglected & forgotten spices & seasonings of Ghana” describes some look really interesting! This entry was posted in baking, fruit, Ghana and tagged apples, cake, food shopping, living in Accra on February 28, 2016 by krumkaker.